Jan Roberts, Catherine King and Janine Orchard returned from their exploits at Nottingham in time to practice for the Club Finals the following weekend in which they were all involved. Friday morning saw the Keith Ewins Open Triples when Janine, husband Mike, and Joy Penberthy lost to good play from Cliff Skinner, Mike Gorman and Terry Reardon who won 23-6. In the Bob Caddy 2 wood singles, orange bowls were in evidence and Mark Perrott’s tactics won the game against Andy Lock by 22-14. Then followed the Dora Wilson 2 wood ladies triples when Catherine King, Myra Furminger, and Fay Hughes had a close game to win 16-14 over Sharon Darton, Jill Perrin and Sandie Cox. The final match on Friday was a close battle in the Grace Mathews 2 wood singles when Jan Roberts only just lost by 1 on the final end to constant rival Sue Harriott. Saturday morning saw two rinks in play, men’s pairs and Frank Deves mixed pairs. Men’s pairs was won by Terry Reardon and David Tucker at 21 – 12 against Ken Roberts and Neil Pond in an exciting final. In the mixed pairs Graham Clarkson partnered Dee Norman to win 26 – 18 against Ken Roberts and Dee Williams, a battle of the “Dees” as leads. This was followed by the Ladies Championship singles when Sandie Cox met Devon Champion Sue Harriott who showed her skills to win again at 21-10. Then Mark Perrott played again this time for the Bob Burch Open Singles when he beat Mike Gorman 22-9. 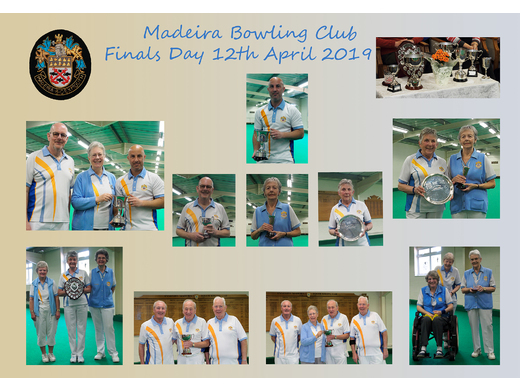 The final game for Saturday was the Francis Newton Open Handicap Singles when Graham Clarkson played again this time against Bob Walker who had a convincing win at 22-9. Sunday morning started with Ladies self-select triples when Jill Perrin, Dee Norman and Joy Penberthy met the National triples team of Jan Roberts, Catherine King, and Janine Orchard and held them to a close game with a final result 19 - 15 to the champions. In the Men’s Club Singles championship Graham Clarkson met Bob Walker again but this time he managed to win 21-9. In the Gooding 3 wood Ladies Pairs Sandie Cox was third time lucky and won with her late substitute partner Sue Lampey 23-14 against Jenny Charles and Margaret Mahon. The final match of the weekend was the Men’s self-select Triples with “New Order” team of Mark Perrott, Graham Clarkson, and Neil Pond all playing again, against "All Sorts", Terry Reardon, Cliff Skinner, and Rob Prescott with “New Order” winning both sets.